The KORBAR Bottle Stoppers are an elegant and stylish way to seal your bottles, save money keeping your beverage for later, without settling for cheap and ugly stoppers, this set is what you've been waiting for! Now instead of being frustrated when you have a half-finished bottle, you can feel relief, using our bottle caps to seal in the full taste of your wine. The KORBAR Bottle Stoppers will seal your bottles and preserve the taste of your beverage for weeks, adding a touch of humor. No flavor added - Guaranteed. Everyone will love these funny and original caps that will keep your beverage in its place. 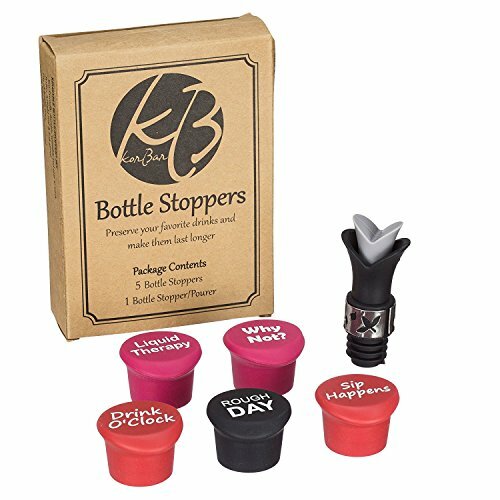 Get this awesome stopper set today and get ready to receive tons of compliments and continue enjoying your favorite drinks! These stoppers are made of food grade silicone and preserves your Beverage with an airtight and leak proof seal. Two (2) Dark Red Bottle Stoppers. Two (2) Pink Bottle Stoppers. One (1) Black Bottle Stopper. One (1) Black/Gray Bottle Stopper/Pourer. Simply Click "Add to Cart" To Keep Your Beverage Fresh & Crisp with the best performing, and unique stoppers you'll find anywhere...100% Risk Free! AIRTIGHT & LEAK PROOF - Preserve the taste of your drinks for weeks providing an airtight seal that is leak proof so you can enjoy every drop of your Beverages (wine, champagne, beer, soda bottles and others). SAFE & EASY TO CLEAN - 100% Food Grade Silicone by FDA approved. Easy to keep clean, dishwasher Safe and Reusable. VERSATILE - Fits all standard wine, champagne, beer, soda bottles and others. ADDITIONAL VALUE - Silicone Bottle Stopper/Pourer with Stainless Steel accent, Constructed of durable rubber and stainless steel that won't rust, , use for Glass Wine, beer bottle, Beverage, Cooking Oil, Liqueur, Flavoring Bottles. MONEY BACK GUARANTEE - If you're not 100% satisfied, simply return them for a no questions asked full refund. If you have any questions about this product by Korbar, contact us by completing and submitting the form below. If you are looking for a specif part number, please include it with your message.